There was a lot going on with doors today. 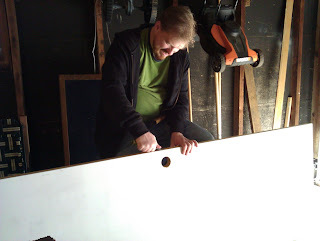 Chris worked on the door for the basement more today, chiseling away a place for the hinges and handle. Meanwhile in the evening I was messing with my own doors - doors to the Mad King's Realm in Guild Wars 2. We also went to see Cloud Atlas today, which was good. Chris has some thoughts over on his blog about it.